Venezuela has one of the most impressive natural landmarks in the world. 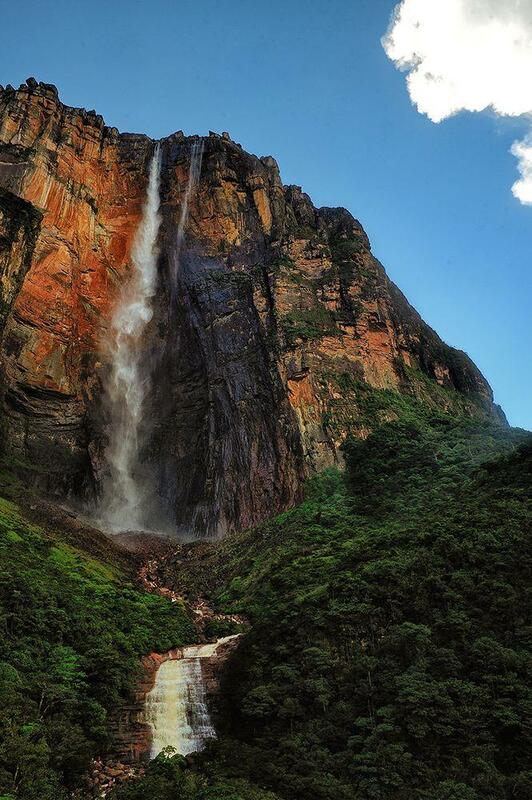 This is Angel Falls – the tallest waterfall in the world. The measured height of falls is 979 m and tallest single uninterrupted drop – 807 m high. The landscape of south-eastern Venezuela and its neighboring countries provides some of the most spectacular sights in the world. Above the dense rainforest here rise more than 100 tablelands which in most cases are isolated from the "land below" with tall cliffs. These cliff walls are hundreds of meters tall, often – significantly taller than one kilometer. These tablelands – tepuis – are formed from Pre-Cambrian sandstone and quartzite and the life on the top of tepuis has been isolated for millions of years. Hundreds of spectacular waterfalls, caves, sinkholes, amazing cliff formations and unique ecosystems are found on tepuis, as well as gold, diamonds and other gemstones. Many unusual stories are told about tepuis – indigenous people are certain that evil spirits live there, but people of European descent often tell about paranormal experiences. 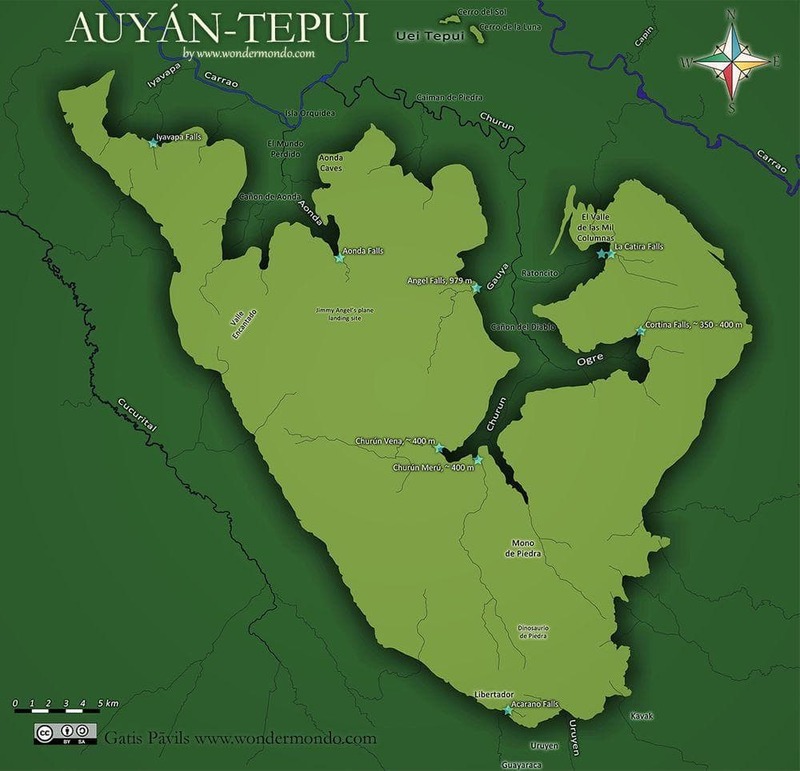 The largest of tepuis is Auyán-tepui (see the map) with the surface area of 667 km². Indigenous Pemon people considered this to be an evil place (they are in similar opinion about most tepuis) and named it – "Devil mountain" (Auyán-tepui). 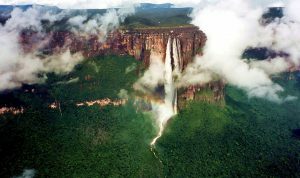 One of the local legends tells that in Auyán-tepui (more exactly – in the Aonda canyon) lives the terrible Canaima – a kind of Death, which always is chasing people and sooner or later finds and kills each of them. The enormous Auyán-tepui is well isolated with tall walls. Numerous endemic species of plants and animals have evolved in this chilly, windy and foggy "world". All tepuis receive much rain – and this helps to create powerful streams and spectacular waterfalls in spite of the small area of these tablelands. Angel Falls have formed in the inner part of Auyán-tepui, on Gauja stream – left tributary of Churún. Waterfall is not only the world’s tallest – it is also very spectacular, located in a gorgeous, pristine natural setting in the canyon of Churún (Cañón del Diablo). Gauja starts in the swamps of central – western part of Auyán-tepui and flows for several kilometers before approaching the rim of plateau. Several hundreds of meters before the rim it disappears among the stones in a deep ravine, which is 40 m deep at the rim. This cleft was created over millions of years and we are lucky that quartzite is that sturdy – otherwise ravine would be much deeper and falls – much lower. River is not wide at the rim – just a few meters. As the water falls down, the stream spreads and gradually turns into mist. As a result at the base of falls has not formed basin. Nevertheless after rain the stream becomes more powerful and falls hit the base. Several smaller waterfalls then appear in both sides of the main waterfall. Further down, some hundreds of meters below the main falls is smaller, 30 m tall cascade. Of course, its beauty is overshadowed by the main fall. The height of falls was measured once – in 1949. Then the number of 979 m was obtained and is used up to this day. 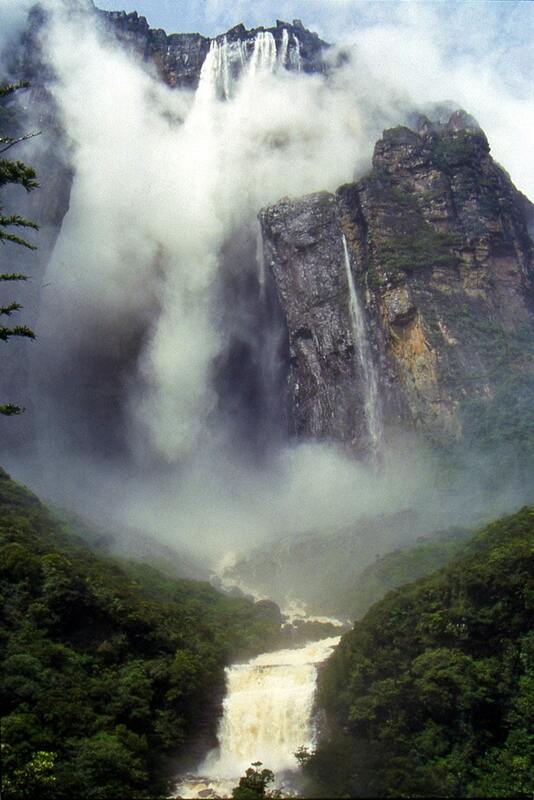 It is possible that this is the height difference between the Churún river and upper rim of falls – thus it may include part of the slope below the falls, which is not a part of falls. The main drop is 807 m tall – the tallest single drop in the world. It is not known with certainty whether Pemon people knew about the existence of falls before the coming of white people. According to current propaganda they named the falls long ago – Kerepakupai ("waterfall of the deepest place") – but there are doubts about this, this name has been used for other falls elsewhere. According to some reports indigenous people call the falls Parakupá Vená ("the fall from the highest point") – but it is not known whether this name was used in older times. Pemon people really feared from these places. First rich gold finds were made near Auyán-tepui in the middle of the 19th century and legends about fabulous finds of gold are heard here up to this day. First diamonds were found in 1913 in Caroni, near Auyantepui. Thus, when airplanes became available, numerous adventurers and treasure seekers started to explore this rugged, unusual and beautiful country. It is well possible that some white adventurers saw the falls in the early 20th century. Ernesto Sánchez la Cruz in 1949 announced that he discovered falls in 1910 – but, according to his diaries he was in Sierra Pacaraima then and, possibly, saw Montoya Falls (more than 500 m tall). Some more treasure seekers most likely passed by without too much interest in world’s tallest waterfall. Adventurer and daredevil, master pilot Jimmie Angel (1899 – 1956) first flew in these places in 1923. Before this, he met in Panama with an old geologist J.R. McCracken who asked for a favor to bring him to a secret place. Angel did this – they both flew through clouds and fog and happily landed on the top of tepui (most likely Auyán-tepui). Adventurer knew the site – it was rich gold find. In three days they collected some 25 – 35 kg of gold (they could not take more) and departed – they pushed the plane over the rim of tepui and only then it caught the speed and started to fly. McCracken soon died – and Jimmie Angel could not remember how to reach the gold find. He started to fly to Auyán-tepui in the search of his landing place. In these times – in the 1920s – 1930s – Auyán-tepui was not on the maps and in Caracas many did not believe that such mountain exists. Thus Jimmie Angel became a discoverer of new lands. 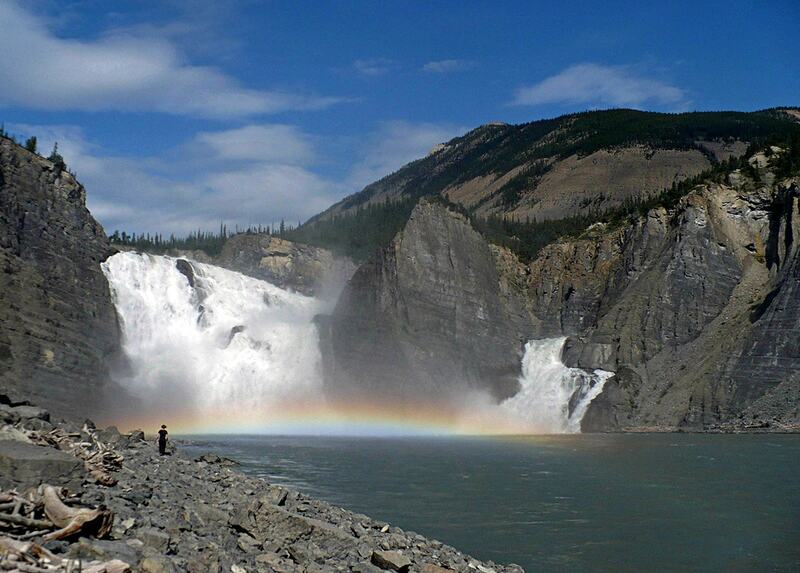 On March 25, 1934, Jimmie Angel with three companions noticed the incredibly tall waterfall. As he returned, he told about this discovery to everyone and the news was published. Soon he took first images of falls and his discovery became a sensation. Angel was confident that waterfall is one mile (more than 1.5 km) high. Further fame to falls came with an unpleasant accident. Angel decided that gold is found on the plateau near Angel Falls and organized an expedition with Miguel Delgado and Gustavo Heny to the top of the mountain. As they rolled out the plane, wife of Angel stopped the plane and demanded to take her, because she would not want to live like a widow. Thus all four landed on the top of Auyán-tepui on 9 October 1937. Unfortunately, the plane was struck in a swamp and had to be abandoned. They left a message "All OK" on one wing of the plane and an arrow in the direction where they left. It took 14 days (not 11 as frequently mentioned) for them to find a way down the plateau and to reach the civilization. Plane remained on the top of the plateau for several decades until it was removed (against the death wish of Jimmie Angel) and now is at the airport of Ciudad Bolivar. 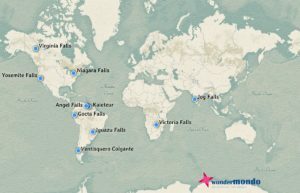 Waterfall was first published on a Venezuelan government map in December 1939 and named – "Salto Angel" – Angel’s Falls. First man to reach the base of falls was Latvian Aleksandrs Laime (1911 – 1994). Laime arrived here in 1941 and became obsessed with the exploration of Auyán-tepui – searching for gold and diamonds but may be – adventures. He befriended local people and learned Auyán-tepui better than anyone else. Laime reached the base of falls alone, in 1946. Later he told that this was an amazing feeling to stand below the falls, to feel the stings of water drops and to think that he is the first one standing below the world’s tallest waterfall. Laime was also the first to ascend Auyán-tepui and reach the upper side of falls in the late 1950s. He started to live next to the falls until his death in 1994. On November 18, 1955, independence day of Latvia, Aleksandrs Laime declared in Venezuelan newspaper "El Nacional" that he wants to name the waterfall stream after Latvian river – Gauja. Soon after he registered the name in National Cartographic institution. Later some more newly discovered streams on Auyán-tepui officially got Latvian names – Ogre, Venta and Daugava. In last decades there have been attempts to rename the streams, especially Gauja. It got name Kerepacupai or Kerep – after the Pemon name of the waterfall which most likely also is recent invention. American journalist and adventurer Ruth Robertson (who by that time mostly wrote for Venezuelan journals) saw the falls from Jimmie Angel’s airplane. She decided to reach the base of falls and to measure their height. She financed the expedition by the sales of her waterfall’s photographs and booklets. Robertson asked for the assistance of American National Geographic Society but was refused – after all several earlier expeditions (led by man!) failed to do this. Finally, she agreed that "The National Geographic Magazine" would publish her material and pay her… after the expedition. Ruth Robertson managed to hire Aleksandrs Laime with a team of Pemon Indians (who painted themselves red to fend off evil spirits) and they reached the falls on May 13, 1949. They measured the height of falls and… to the disappointment of Jimmie Angel, this was not a mile high waterfall. 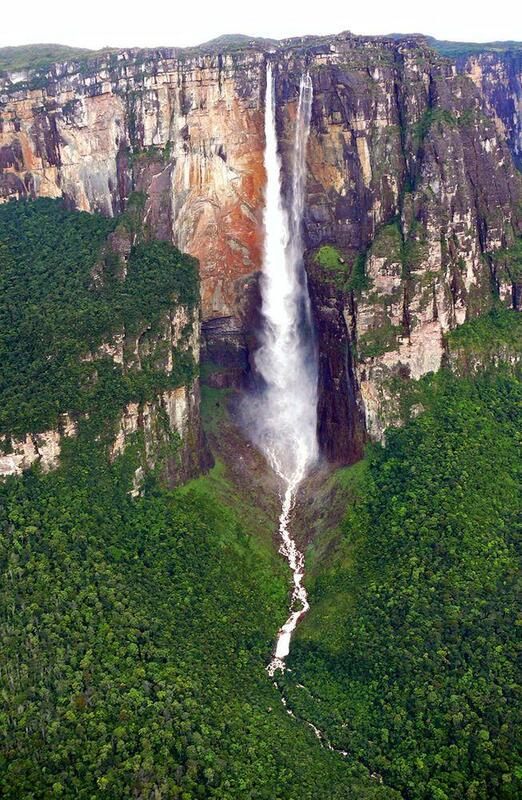 Nevertheless, it was proved that Angel Falls are tallest in the world. The first officially approved name of the waterfall is Angel Falls, named after Jimmie Angel. Kerepakupai Vená most likely is a recent invention, but there is a chance that Pemon people named the falls – Parakupá Vená. The merits of Jimmie Angel should not be diminished – most of the other adventurers, including local Venezuelans, were interested only in wealth, but Jimmie Angel (who, of course, was also interested in wealth, but…) manifested to the world the beauty of Venezuelan tablelands, thus paving a road for later conservation efforts of this unique place. The officially approved name of the stream of Angel Falls is Gauja. Kerepacupai or Kerep most likely is recent invention. Ruth Robertson was not the first to reach the base of falls. This was done in 1946 by Aleksandrs Laime, later guide of Ruth. Expedition of Ruth Robertson was not organized or financed by the National Geographic Society. She financed and organized it herself after National Geographic Society refused any assistance. Often it is claimed that tepuis of Venezuela inspired Arthur Conan Doyle to write his timeless novel "The Lost World". Wrong!!! Conan Doyle was inspired by the tales of his good friend Percy Harrison Fawcet who discovered the similarily amazing Huanchaca Plateau in Bolivia. Karen Angel. Why The World’s Tallest Waterfall is Named Angel Falls. Terrae Incognitae, Vol. 44 No.1., April, 2012. …an exotic Indian girl leads them, through piranha-infested rivers and jungles teaming with poisonous plants, to Tepui Zupay – the forbidden mountain no outsider has set eyes on since the Spaniards met their doom. Sorry, no idea. This is not a tourist website.